I will show my private work relating Mac. 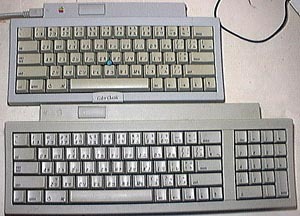 This is based on Apple Keybord II made in Malaysia. 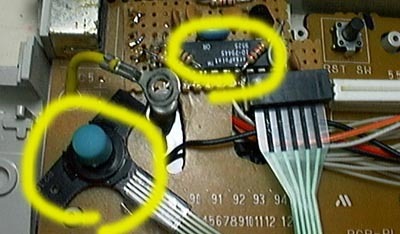 It is able to move the main control tip to center of basis upside down. And the tip was re-connected to all cables. The ten keys and contact points were cut off. 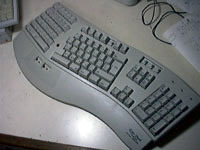 Track point unit and the control tip was picked out from SANWA SUPPLY "ELGO-TOUCH KEYBORD SKB-ERGMJ". Re-constructed contol tip board and track point unit. All parts were assembled. 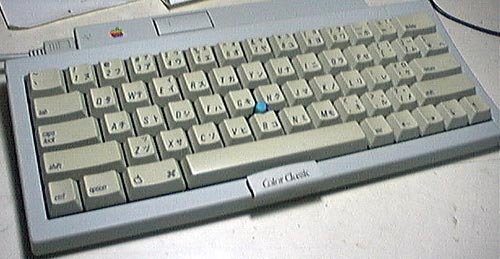 Click button was made by Color Classic's name plate.